SABO offers a variety of educational workshops and tours. Mini-workshops include two days of activities, usually starting with a morning classroom session followed by field trips to local hot spots appropriate to the subject and season. Regional tours spend up to a week exploring a wider variety of locations. For more information on upcoming workshops and tours, please visit the Calendar of Events. Interested in more exotic destinations? Check out our International Tours. Mexican birds are part of southeastern Arizona’s allure, but few birders venture into neighboring Sonora. Within a day’s drive of the border is a land of Black-throated Magpie-Jays, Social Flycatchers, Elegant Quail, Squirrel Cuckoos, Mexican Parrotlets, and much more. * The actual itinerary will be flexible and may change as opportunities and/or access issues dictate. $1750 per person/double occupancy*, $2050 per person/single occupancy. SABO members are eligible for a discount of $30 per person. Package includes 7 nights’ lodging, ground transportation from Tucson, tourist and guide fees, and meals from dinner the first day through lunch the last day. Alcoholic beverages, guide and lodging gratuities, and other personal expenses are not included. Limited to 8 participants. A deposit of $200 per person is required to hold your reservation. For additional information, please contact SABO. Southeastern Arizona is a birder’s paradise during spring migration as the arid valleys and lush “sky island” mountains come alive with northbound travelers and local residents. Birds of many species are particularly active and vocal this time of year, making it an excellent time to search for owls and other mysterious and elusive night birds. Last year’s tour saw 18 owls of 7 species. The field trip destinations have been selected to highlight the best that spring has to offer, including the owls, other raptors, Elegant Trogons, songbirds, and hummingbirds that make this region so special. The tour will include short presentations to give you an in-depth understanding of the natural history, behavior, and identification of the species of owls found in the region. Tour activities will include short hikes on easy to moderately demanding trails. Late spring in southern Arizona can be warm, with daytime highs in the 80s to low 90s. To compensate for early mornings and warm afternoons, many days will incorporate an hour or two of siesta time. Featured lodging for this tour will be Casa de San Pedro Bed & Breakfast, adjacent to the San Pedro Riparian National Conservation Area. $1515 per person for SABO members, $1545 per person for non-members, double occupancy*; add $460 for single occupancy. Package includes 6 nights’ lodging, ground transportation from Tucson, entrance fees, and meals from dinner the first day through breakfast the last day. Alcoholic beverages, guide and lodging gratuities, and other personal expenses are not included. Limited to 8 participants. A deposit of $200 per person is required to hold your reservation. 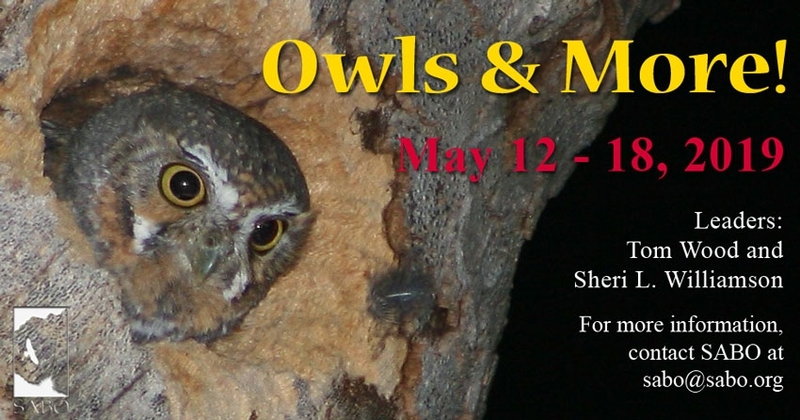 Register for Owls & More! 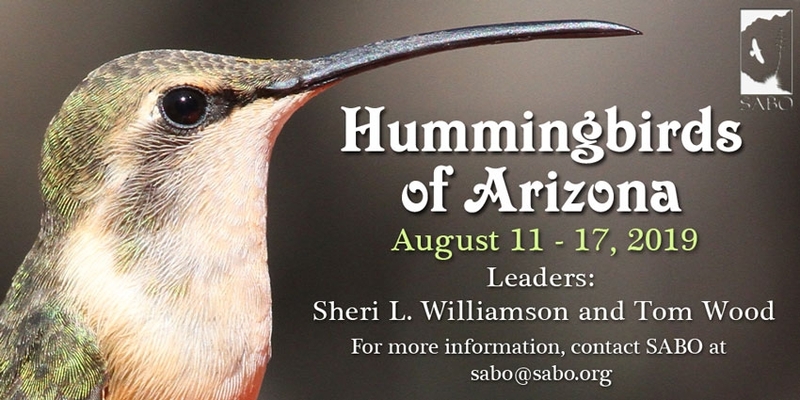 Explore southeastern Arizona’s hummingbird havens with Sheri L. Williamson, author of the Peterson Field Guide to Hummingbirds and one of America’s foremost hummingbird experts, and SABO’s founder and Director/Naturalist Tom Wood. August is one of the most exciting months for hummingbird watching in southeastern Arizona. Summer thunderstorms bring a second spring to the “sky island” mountains and valleys. Blooming wildflowers and the area’s famous feeding stations attract up to 15 hummingbird species plus many other colorful birds, butterflies, and much more. Most field trip destinations will be of particular interest to hummingbird aficionados, but we won’t neglect the songbirds, raptors, butterflies, and other wildlife that make this region so special. The tour will include short presentations to give you an in-depth understanding of hummingbird natural history and identification. To compensate for early mornings and avoid thunderstorms, many afternoons will incorporate an hour or two of siesta time. * The actual itinerary will be flexible and may change as unusual opportunities and/or access issues dictate. $1515 per person for SABO members, $1545 per person for non-members, double occupancy*; add $460 for single occupancy. Package includes 6 nights’ lodging, ground transportation from Tucson, entrance fees, and meals from dinner the first day through breakfast the last day. Alcoholic beverages, guide and lodging gratuities, and other personal expenses are not included. Limited to 8 participants. A deposit of $200 per person is required to hold your reservation. For additional information, please contact SABO. * Standard rooms at Baymont by Wyndham and Casa de San Pedro are equipped with one king bed; please let us know if your party will need two beds. Register for Hummingbirds of Arizona!